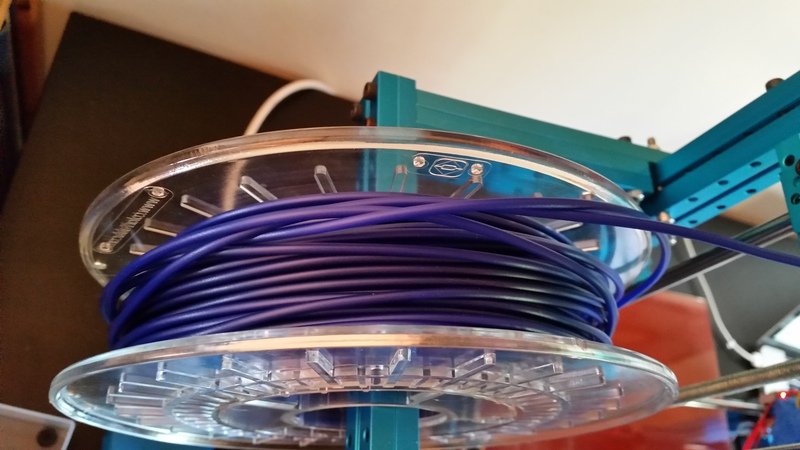 Filament review: Printing with potatoes? One thing that fascinate people about 3D printing is the fact that the PLA plastic we often use as material is made from Corn. Now you can get a bioplastic made from potatoes as well! In this review of the bioplastic called Biome3D I'll highlight how it prints and how it differs from other materials. It has some quite useful properties! The majority of PLA available comes from the company Natureworks. They sell the raw material to plastic manufacturers that add colorants and other chemicals to achieve their desired properties. The Corn based PLA most often used for 3D printing is the Ingeo 4043d grade but you can find other variants and producers. The potato based bioplastic I'm testing here, is made in the UK by the company Biome Plastics and it's primarily sold through the website 3DomFilaments. I initially purchased some samples, but I picked up a couple more rolls since I wanted to test some more. The first thing I noticed is that it's nowhere as brittle as PLA. This is a major advantage. When you take a piece of the filament and bend it, it acts more like ABS. It bends and becomes more white in color. You won't break it until you bend 10-12 times. 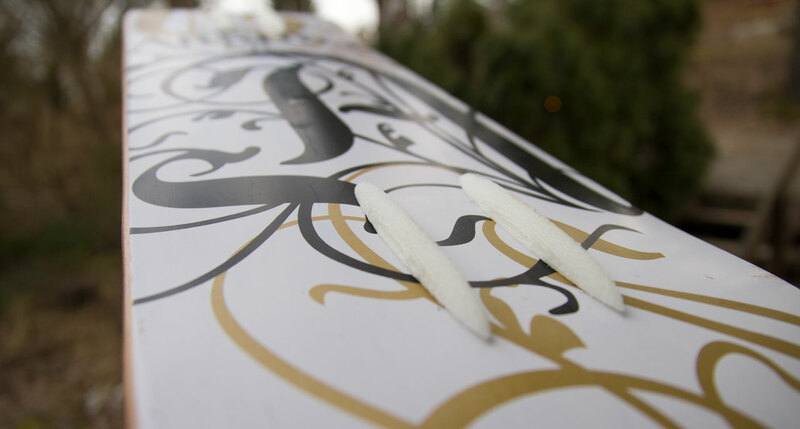 The material is strong and allows quite some bending before it breaks. It's not anywhere as tough as PET though, but much more suited than corn based PLA for applications that will be experiencing any degree of flexing. It is still stiff and solid and it barely shrinks at all. When printing, the layers bond really well and I can extrude it nicely all the way down to 175C - a very low temperature for my printer. It also has a nice, matte shine to it and theres basically no smell when heating the material. 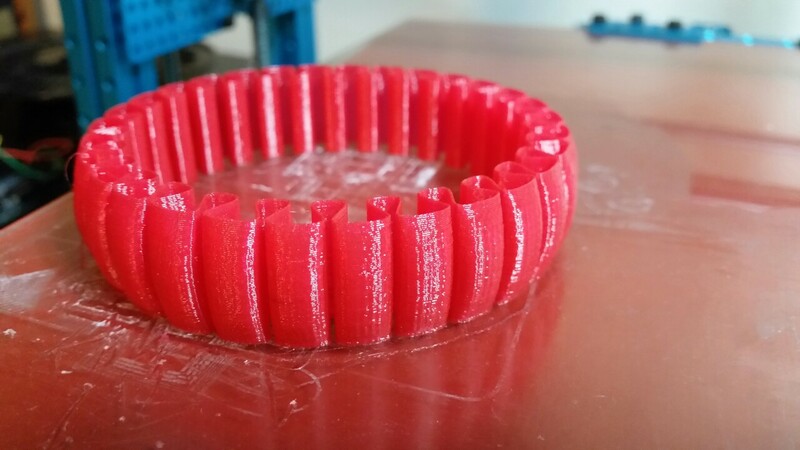 What I find the most fascinating about this material is how different it looks from other filaments when extruded! When this material flows out of the nozzle, it behaves different than other 3D printing filaments I have. If you just push material out of the extruder, it will not hang as a nice, thin string. Instead, it will become a "lump" that gets a "skin", but keeps filling from the inside with hot material until the lump becomes so heavy that it falls off and create a new lump. Check the video below to see what I mean. In other words, this material seem to "store" heat longer than other filaments. You can very much feel that if you try to squeeze one of the lumps of plastic that fall down. The Biome 3D filament goes soft at 80-90 degrees, but you can print it at much lower temperatures than most other materials. As can be seen from all the horizontal stripes in the picture at the top here, cooling is essential. My printer is currently in the middle of a conversion to dual Flex3Drive (Writeup on this brilliant tech soon!) so I barely have any cooling. This shows clearly as lines along the prints. Lowering the temperature helps a lot and it prints well down to rather low temperatures. This stuff can be sanded! Normal PLA will melt as soon as you start sanding or polishing it, but the Biome material seems to have a high enough Glass Transition temp that you can actually work it quite a bit before it deforms. That means that normal sanding is possible, but also tumbling with various mediums. As can be seen above - my lack of cooling causes stripes in the print. I didn't sand the piece in the middle all the way down as the grooves were quite deep, but you can see how well it works. PLA will heat up and melt as soon as you sand it, but the Biome 3D filament holds up well as long as you don't repeatedly sand the same spot. I was even able to sand it using a Dremel as long as I kept moving to allow some cooling. It is impossible to polish the material to a shine like you can for ABS as it's matte by nature. I have not tested how well paint sticks, but I'll do a test and add that here later. 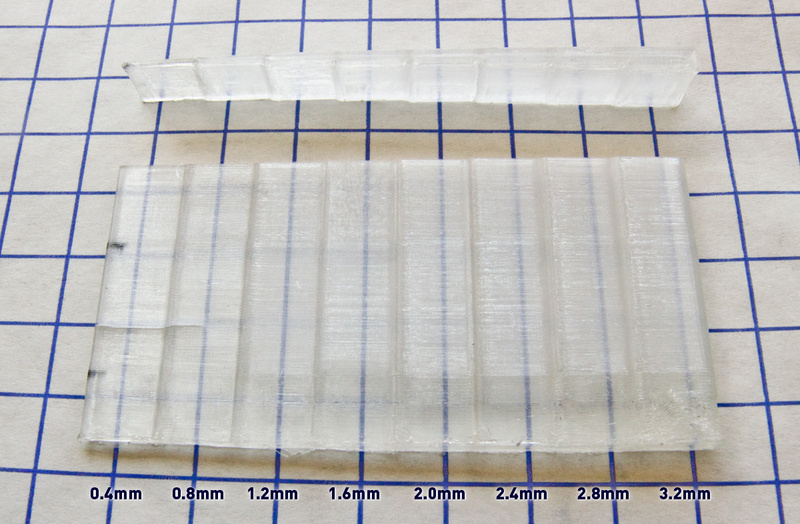 I can't find a proper datasheet, but the ability to sand the parts made me think that the Glass Transition temp was higher than the 70C typical for other PLA and lower than the 110C for ABS. I did some testing by submerging a printed part in 70C tap water. This revealed that it does indeed deform at this temperature and it also deformed at 60C. At 55C the object held up, so a Glass Transition temperature of 60C seems likely. That's actually lower than some PLA variants and makes it unsuited for parts that are exposed to heat. In other words - this won't replace ABS as a way to print spare parts for your dishwasher or similar tasks. I also tried flame polishing the material. It does bring out a gloss but it's extremely hard to not apply too much heat. Since the heat builds up inside the material, I managed to get what looked like a perfect finish, but then after a few seconds it looked like above. The heat in the material kept melting it… I also tried to treat it with acetone, but it has no visual effect. It does however seem to dissolve the plastic to some degree. Now this seems all very cool, but there must be some negative things also? Of course there is, but they're not that bad. If you follow the manufacturers recommendation and use a heated bed at 60-70C, you'll see the prints sag at the bottom (Elephant's foot). I've actually seen this in all my prints to some degree, despite lowering the bed temperature to 40C. 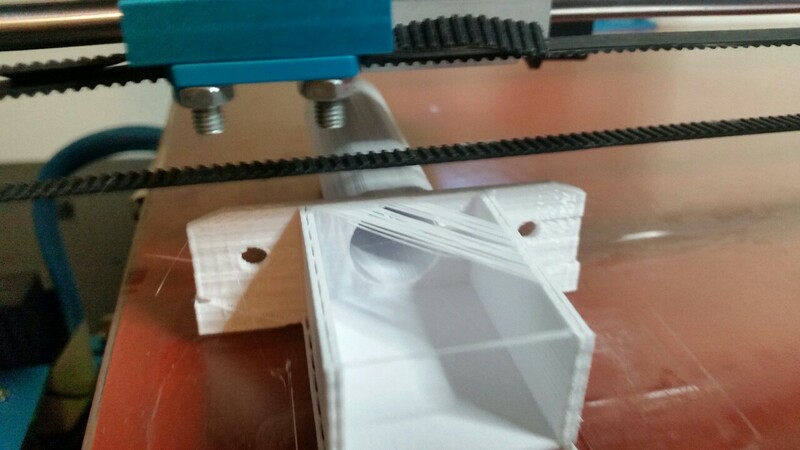 Like said before - a lot of cooling is required when printing with this plastic as heat is "stored" in the plastic. In other words - extra fans may be required. Melted onto the filament was a lump of plastic from the production. This would have ruined the print on any printer. I happened to notice it, but you really don't want to see stuff like this. 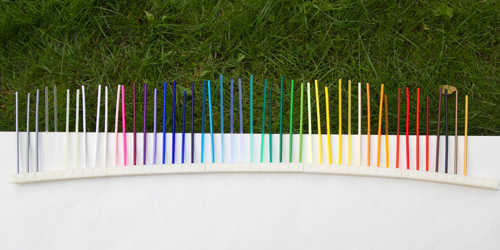 The material comes in the colors white, black, red, yellow, blue, green and pink so the selection isn't exactly stellar, but this is sufficient for many. Only opaque colors exist for now, so no translucent yet. When I purchased, I was first sent 1.75mm plastic despite ordering 3mm. As a compensation, they gave me half a roll of another color - so while the webshop isn't completely routined, they do offer good customer service. In other words - I like the filament, but they need to ensure the quality is consistent. With that, I think this can be a good replacement for the fossil ABS filaments. I especially like that you can sand it and that it's more flexible than ABS/PLA! I've been meaning to test the flexible NinjaFlex materials, but having an Ultimaker made that impossible. 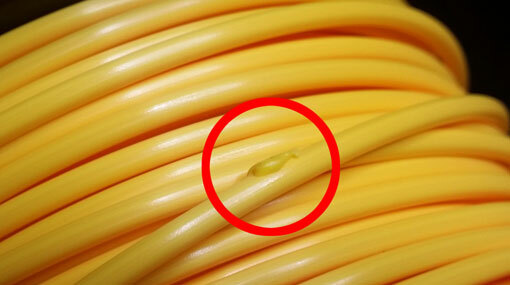 Flexible filaments and bowden tubes don't play well as the friction of the plastic makes it curl and stop. With the new BAM printer, I have a direct extruder mounted just above the hotend. This is the ideal setup for flexible filaments and with the newly fitted Bulldog XL extruder it's a snap to change materials. I can't quite get over how solid objects printed with NinjaFlex are. They're soft in that they can be curled together, but will regain their shape easily. If you print a single wall of NinjaFlex (0.4mm thick) it will take a lot of force to tear it apart. My first print was exactly that - a single wall stretchlet. My first reaction was how soft it felt? Then I tried to tear it apart and I failed? I gave it to my teenager son, but he also couldn't tear it apart. I then put my foot on it and pulled with full force by two hands… It expanded to 5-8 times the original length and then snapped just like a rubber band. Only when it snapped (main image) could you see any sign of layer separation. Amazing stuff! The elasticity offers some very desirable properties. 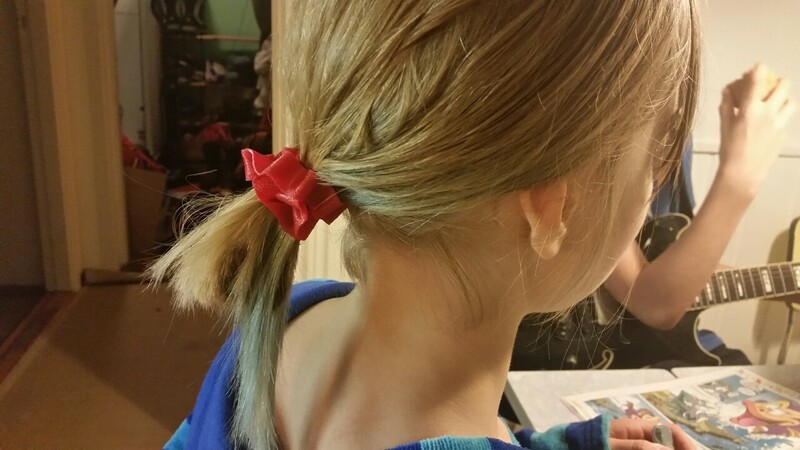 For instance, a 2-perimeter bracelet can also be used as a hair band in a crisis. It is perfect for making noise dampening rubber feet for your Makeblock printer, BMX grips, phone bumpers and RC tyres. 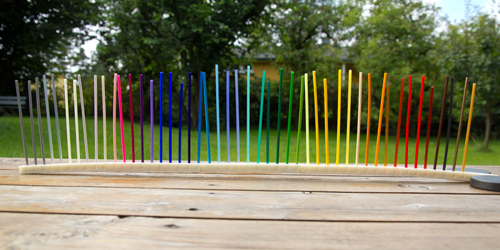 Fenner Drives that makes the NinjaFlex filament, recently came out with more colors including silver & gold! I'm really looking forward to play more with this filament. I picked mine up from E3D along with other parts, but you can find it many places. 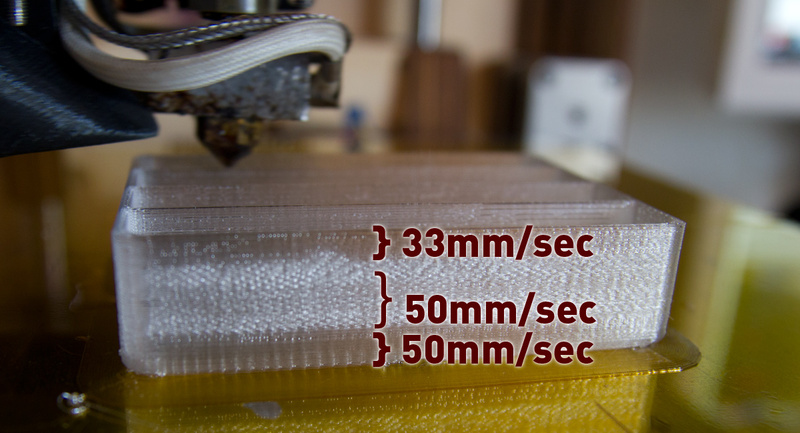 If you go faster than 30mm/sec, the plastic will curl up inside the BulldogXL extruder. Some time ago I posted some tests done with Colorfabb's XT plastic. I'm guessing that the people from MadeSolid read that and wanted me to test their PET+ filament? I love testing new plastics so of course I said yes to getting some samples! Just like Colorfabb XT, the PET+ material from MadeSolid is made from PET plastic so I expected the two to be kind of similar. PET is the plastic used in drinking bottles and food containers, so just from that you know it's solid. It's much more solid than PLA as it's not brittle at all. It's stronger than ABS and extrudes at temperatures somewhere between PLA & ABS. I had actually looked at the MadeSolid materials just the week before as they could offer both transparent, translucent and opaque PET+ filament with a decent range of colors as well. 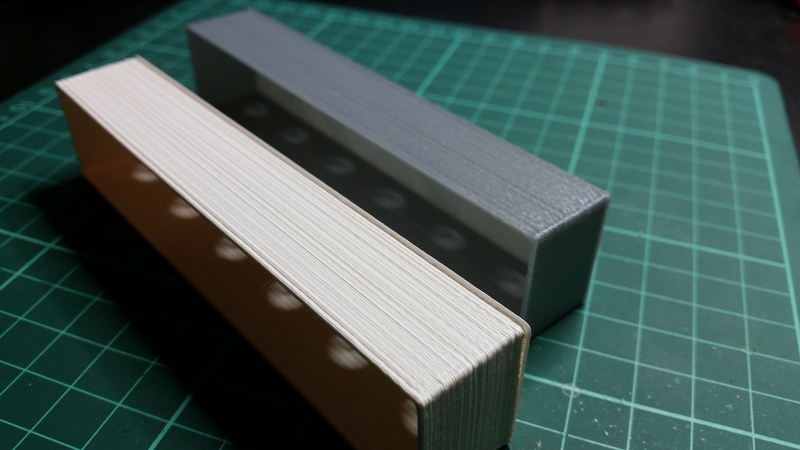 Just last week, Colorfabb also introduced some opaque colors, but at the same time they upped the required temperature from 220-240C to 240-260C making them harder to use for many. As opposed to Colorfabb, the MadeSolid guys offer extensive printer profiles for their filaments http://madesolid.com/printers It is quite interesting to see as this highlights how differently the various printers are tuned. A Leapfrog printer should be set to 225C, but a Makerbot should be at all the way up to 255C! I really like how the final prints look. They come out glossy and the material is very easy to work with. There is a tiny amount of warp, but a brim is sufficient to hold things down on the build surface. 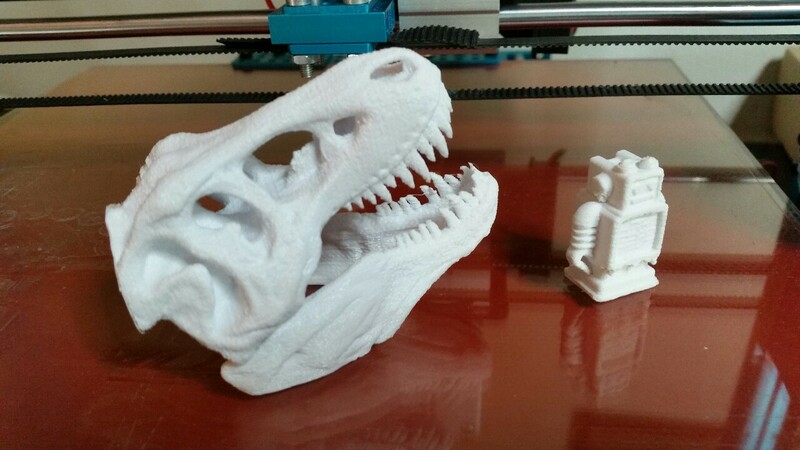 T-Rex at 0.2mm & UltimakerRobot at 0.005mm. One can clearly see that I need to tune the printer a bit more as I have some "wobbly" somewhere, but the prints look really good despite that. I received about 5 meters of the clear & 10 meters of the white PET+. With this I printed quite a few tests, but I ran out of sample plastic before I got the settings properly dialled in for my printer. That is - I thought that I had it right, but when exposed to pressure it turned out the layers had not bonded fully? The transparent PET+ actually seems a little easier to work with than the XT as I'm not getting these tiny blobs along walls that I do with XT. 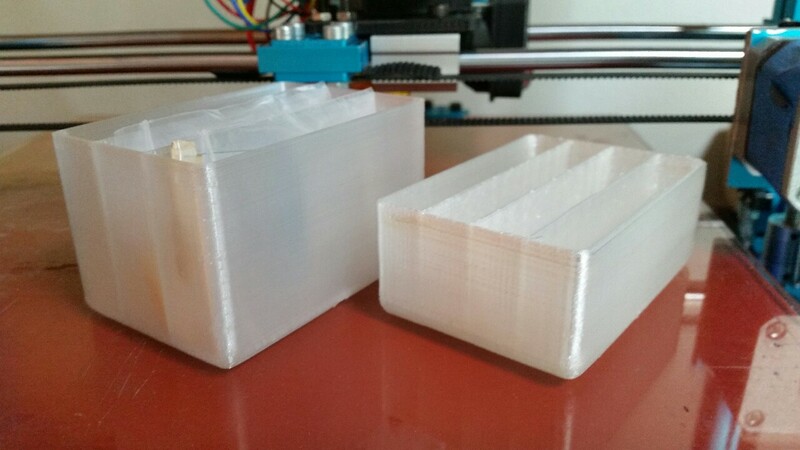 All the walls of the Raaco resistor-box came out looking perfect and the final print is so solid that I need pliers to damage it. When reflecting a light-source it also appears to be more shiny/reflective than the XT, though the transmissive properties are very similar. Bridging was interesting. I had a model that has a decent bridge. It's 29mm so I didn't expect that to work, but initially it looked to be going well. Then the plastic started smearing onto the nozzle and things became really ugly. I set the print to pause, cleaned it up and kept running at a higher speed. That turned out to be a bummer. After a lot of cleaning, I realised that going slower was the best. Next time I'll use Slic3r instead of Cura so I can tweak the speed for bridges. The print came out fine in the end and I was really impressed by how easy it was to remove the supports? That was of course related to the poor layer adhesion that I discovered later, but after testing some more it seems to be just as easy to remove PET-based support as it is to remove ABS. I am really liking this plastic, so I just purchased some rolls with the translucent colors (red + blue) as well as opaque white. I wish that MadeSolid had more colors available (like translucent & opaque yellow, orange, purple & more), but I guess that'll come with time. Next up for this weekend is testing flexible filaments. I have two rolls of NinjaFlex as well as "transparent rubber" from the Italian company PlastInk. Should be fun! Just days after I sent my order, MadeSolid published a lot of new colors. Now they have 15 different colors to choose from. Pretty good! I've had a few really hectic months with a crazy amount of client projects. Hopefully that'll manifest itself on my bank account, but this weekend was my first few days of calm in two months. Time to play with the 3D printer again and experiment with one of my favorite filaments - ColorFabb's XT! ColorFabb XT has been one of my favorite materials for a long time. In terms of properties, this PETG is sort of a crossover between PLA and ABS. As opposed to PLA, it is strong and quite flexible and it's much easier to work with than ABS since it barely shrinks at all. I've had varying results with it over time so I thought I'd experiment a bit with what are the best settings. I first ran a series of tests to see how it's affected by speed (A), flow rate (B) and temperature (C). I started with a base of 50mm/sec / 235C and the output looks good at both 50 and 100% of that speed. As soon as you go above, you'll see the pillar becoming less transparent. This is due to small bubbles of air and indicates that it's not feeding enough plastic through the extruder. This could be compensated somewhat by increasing temperature, but it seems that 60mm/sec is about as fast as I can go. When it comes to flow, the output looks good even at 90%, but at 80% it suffers (as expected). Nothing really interesting there, and also not when it comes to temperature. The 220-240C that is printed on the box the filament arrives in, looks quite correct. One of the things I really like about XT is it's transparency. You can't really make it fully transparent, but you can get some very nice effects by calculating your model to have walls that are a multiple of your nozzle size. In the image below, you can see how thickness affects transparency. The wall thickness is written below the different wall segments. Opacity is quite good when holding the object close to the XT, but as soon as the distance is increased opacity suffers. The upper piece is a shorter model with the same thickness, but it's standing upright. What is interesting is how much the slicer affects transparency. I'm using Cura 14.01 for slicing and it constantly calculates the feed rate for infills incorrectly. 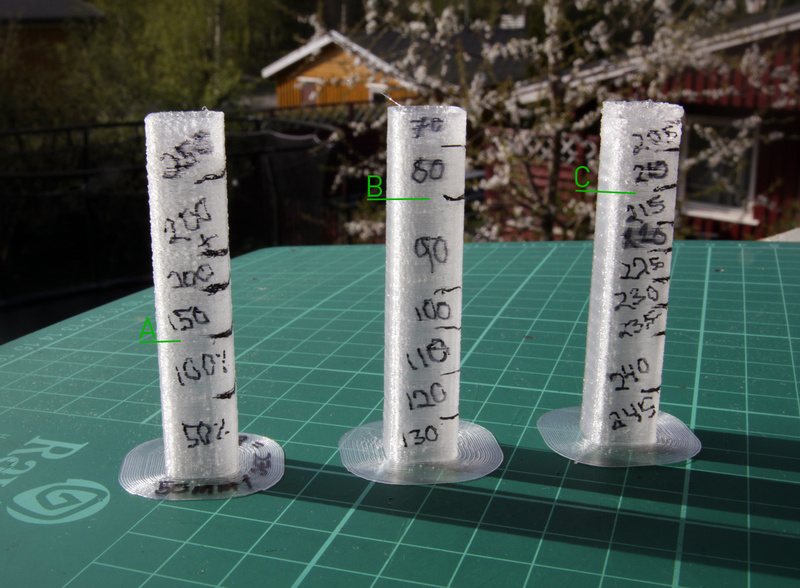 To get enough material when filling 100%, I have to increase the Flow Rate to 160%? This must surley be a bug in Cura, but you can work around it by setting the Shell Thickness (= # of outlines) to a very high amount. Another observation is that you will get the best transparency when you have long, straight lines. Curves & corners will automatically give you less transparency. A hot tip if you get blobs or threads on the walls of your model, is to turn off Combing. This will force retraction on all moves and if your settings are otherwise correct, you'll completely remove the blobs. Another tip is that if the first few layers look good but the object then looses transparency, you can often save things by just slowing down a little as in the image below. The first two of these are PLA and the last one is XT - otherwise using similar settings. Why was the XT so much less transparent? There were no difference? I then understood what the problem was. To get XT fully transparent - you cannot use the fan! In the image below the first one (A) was printed with the fan turned off until starting on the walls of the box. The second (B) is the best I could do with the fan turned on. The third is the reason I had the fan on - unless the fan is on, you'll get small blobs along the wall (C). 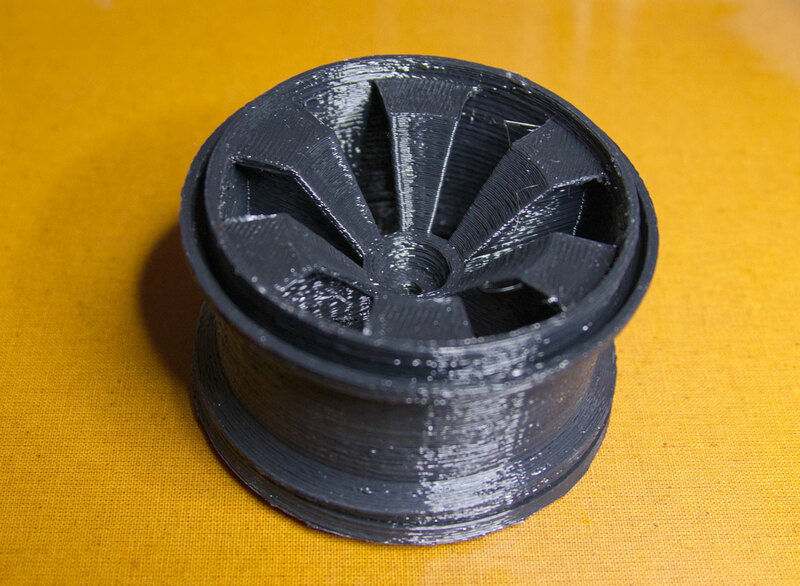 This is easy to solve however - Cura has a brilliant plugin-system that can turn the Fan on after either X layers or X millimeters of printing. Now, these boxes come out nicely every time! So my magic settings for getting ColorFabb XT as transparent as possible - 35 mm/s, 235C, 105% flow & no fan for the transparent area. If you have a heated bed - crank that up as well as it'll help the layers blend by keeping the XT as hot as possible, so it blends better the next time the nozzle passes. Then you can crank up speed to 50 mm/s and turn on some careful fan cooling. 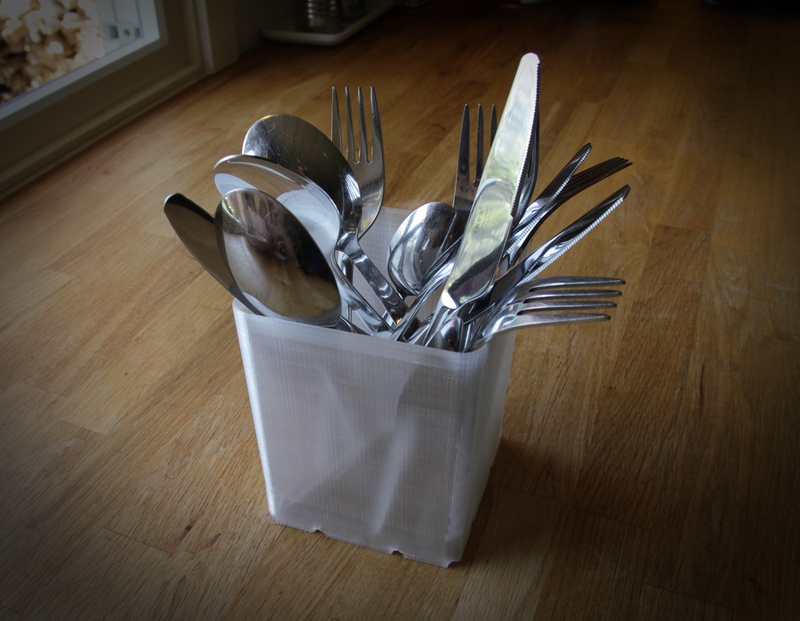 The reason I played around with this was to make a cutlery basket for my kitchen. Below you can see how it turned out and you can download and print the model here. I'm working on a really great 3DP project but I will have to wait a little while before I can tell all the details. However - in this project I'm making some really cool touch-sensors with 3D printing and I thought that I'd share my experiences with the "Conductive ABS" that is sold by Reprap-Walmart (Repraper.com) and numerous others sites. It may seem as if there are multiple vendors for conductive plastic, but in reality it's just a single, chinese company. I bought mine from Repraper.com and I suspect that most of those selling Conductive ABS are getting theirs from the same source. They all have the same spool, so it's easy to spot just this. This means that if you see Conductive ABS in a RepRap webshop, they most probably got this and all their other filament from china/reprapper. This plastic is difficult to print with. The main reason is that to be electrically "conductive", it contains a lot of carbon. This narrows the useful temperature area. On my printer (Ultimaker) I had to use 230-240 degrees. 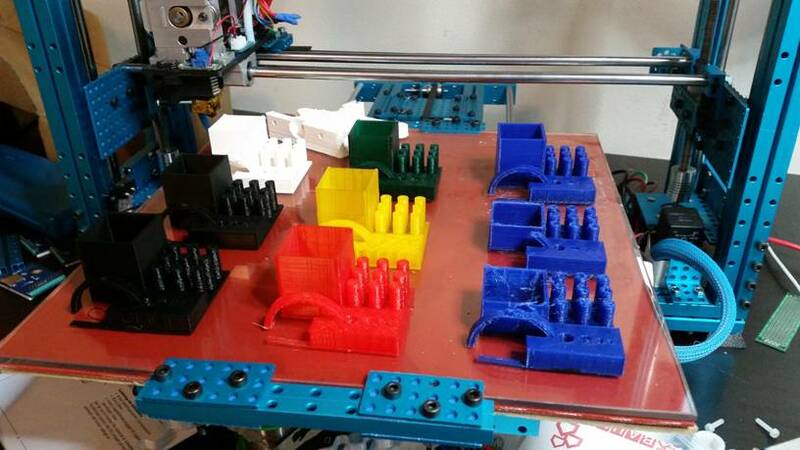 I suspect it will be similar for any other Reprap or other 3D printer. Anything less than this and the print delaminates (click the image above to see this on the cylinder to the right). Anything more and you also got a plug. Since I got my Ultimaker (a year++ ago) I never had a plugged extruder. While printing with this material I had 8 plugs and it's a real hassle to fix. This makes filament grinding a major issue. Took me forever to figure out exactly how much pressure to use when feeding the filament into the Bowden. Because of this, it's also next to impossible to print with retraction, so keep that in mind when modeling. So to sum this up - try to avoid this material unless you enjoy dismanting your printer. It is certainly conductive and small prints can probably print without a problem. Just don't think that this is as easy as other materials. It's annoyingly hard. If you know of alternate providers of 3mm conductive plastic, I'm really keen to try them out so please post a comment below. PS: I should also mention that the color-changing filament from Reprapper.com only changes color BEFORE you put it though the printer. I got the purple-to-pink filament and after printing, it's impossible to make it purple again. Would have been fun - if it worked.